With each passing day, more and more progress is being made in bio-sourcing polymers that have been traditionally based on petroleum products. While the end polymer will have the same generic name (polyethylene, polypropylene,...) the chemistry involved in getting to the starting monomer will be completely foreign to a traditionally trained chemist or chemical engineer. Currently, ethylene, propylene, butadiene,... are made from hydrocarbon feedstocks that are "cracked', dehydrogenated or otherwise processed to form the desired product. It's simply a matter of selectively removing a few hydrogen atoms from each molecule. 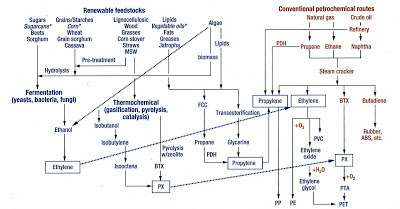 Ethylene for instance, is made by the dehydration of ethanol, while PX (para-xylene, which ends up becoming p-terephthalic acid, a monomer used to make PET) starts out from isobutanol, which like ethanol, is dehydrated to become isobutylene, but then is dimerized to become isooctene and then cyclinized (?) to become PX. That's quite a bit different than the standard route of physically separating the PX from the BTX (benzene-toluene-xylene) mix. Or who would think that propylene would be made from plant oils? The fatty acids are removed to leave glycerin, which is then reduced to the monomer. Once the monomers are made, they can be polymerized as before. This is significant as it means not only that the capital investments already made in polymerization plants will endure, but also that the final products will be virtually indistinguishable from their petroleum-base equivalents. While long-time readers know that I loathe calling anything a drop-in replacement, this might be one of the few exceptions I would consider using the term with. 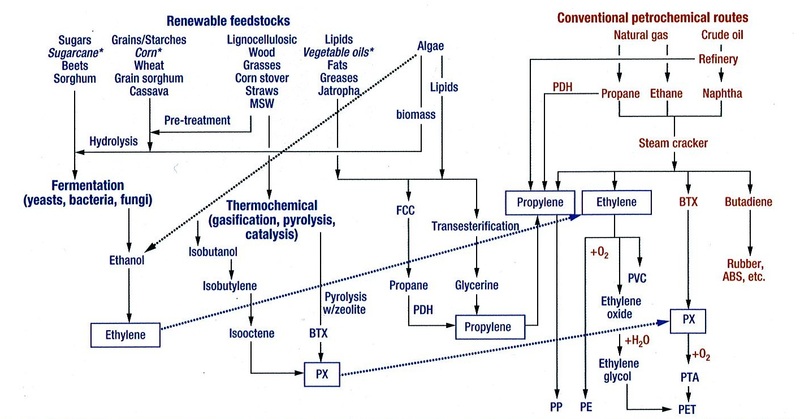 The only difference would be that the bio-based polymers would have a few extra neutrons - biobased feedstocks have a small but measurable amount of carbon-14, whereas petroleum based feedstocks have long ago lost all traces of this radioactive component. This difference ensures that it will be difficult for someone to greenwash a petroleum-based polymer and sell it as bio-based. This is the future of commodity chemistry. It is very different from that which our forefathers had and it will replace the knowledge that they passed on to us. Great post, John. It'll be interesting to see what catalysis methods it will take to get there.